You want to get rid of the king!!! The only way is to give that gluttonous monarch so much food, he’ll explode!!! Originally this game was for the Ludum Dare Compo, but because of circumstances, I wasn’t able to work on it the 2nd day. So I finished it on Monday. You can set the audio volume and mouse-sensitivity in the options menu. And you can rebind the controls in the standalone versions. Hi HOeHO, thank you for playing the game! Your video is very funny, thanks! Thanks for playing, I had fun watching your video! It is very rough and unfinished, but I'm glad you enjoyed it! I enjoyed putting together the sandwiches. 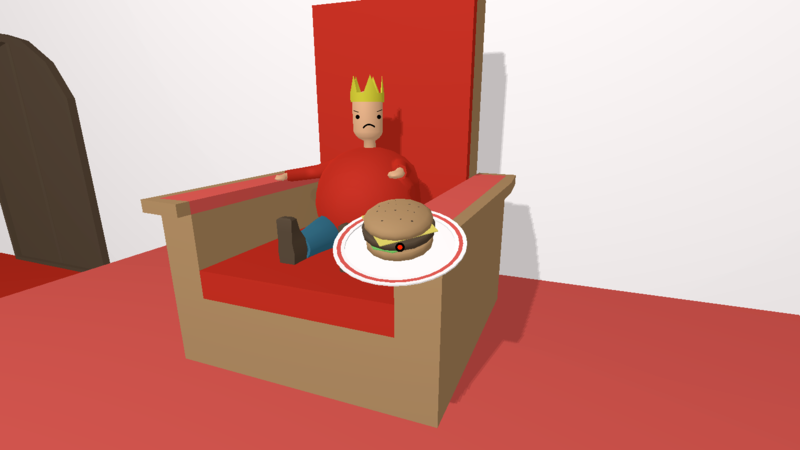 Would be neat to add more recipes and have the king get upset if given the wrong order. Overall a fun experiment for a game made in 48 hours. 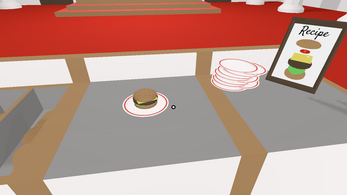 (btw, page says you can rotate food with Shift + Scrollwheel but don't believe the feature has been added to the game). Thank you for playing! My intention was to have the king shout what he'd like to eat, and you had to make the meal. But sadly I ran out of time so there are only hamburgers. I will look into the rotating, because it works for me. Thanks for the heads up!